Updates to Peter F.'s profile since your last visit are highlighted in yellow. I have been married to Kim since 1986. She is a 1980 graduate of Mt. Lebanon. As of now, November 2009, Patrick is a freshman at Slippery Rock University and Katy is a sophomore at Mt. Lebo High School.. Both are avid lacrosse players. Kim's brother Tom Kolesar is a fellow class of '78 alum. This website is absolutely awesome! Many thanks to those who put it together. SORRY! Got a little carried away with the pictures - it was a lot of fun after looking at a lot of profiles to add some of my own. Patrick graduated from Mt Lebanon High School June 11th, 2009 It is so hard to believe and also so great to see him graduating from the same school that Kim and I did. Peter F. O'Donnell has a birthday today. Jay Black & I circa 1975. Was I ever that skinny & did Jay really have that much hair? 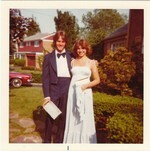 Prom night with date Lisa Burke. My 1st baby - 1984 Firebird with T-tops and a 5-speed that I bought for myself on Christmas eve. Kim thought she was getting an engagement ring for Christmas! Oops! 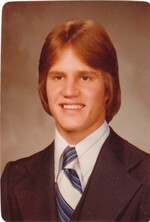 My roomate, Jeff Lynch, freshman year at Miami University. Party in the basement at my house. Noreen Dean, Monette Shuttleworth, Gwen Greco, Carl Kelly & Dave Williams thinking "Get that camera outta here!" My buddy Kevin Lape, God rest his soul, at a friend's wedding in 1985. He passed away in 1988. Wedding picture with my bride, Kim Kolesar, 1986. Were we young?!!! My dad, me & my best man, Mark McFarlin on my wedding day.